Program the shutdown of your PC with PC-Off Download Do you leave home for a few days, but you have not finished with a download and you can not turn off the PC ? 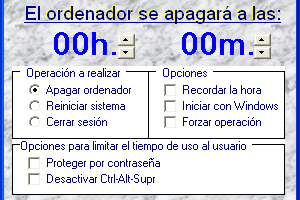 Are you going to sleep and want your PC to shut down in a couple of hours? For that you have PC-Off, a tool for Windows that allows you to program the shutdown of the computer. You can program PC-Off to open every time you log in to Windows, and once you have chosen the time you want the PC to shut down, it will be registered. The program remains inactive in the Windows taskbar until the time comes to fulfill its function. Among the PC-Off options we have the Quick Shutdown, which forces the shutdown of all open applications when it is time to shut down the PC (this is not recommended), and we also have the option of, instead of shutting down the PC, Restart it or close the user session at a certain time.